Read the "top ten" list created by Savon Clark, a student at Cabrini Connections. Bad night in Chicago. 16 shootings, including one where seven people were shot. Nicole White of the Tutor/Mentor Connection wrote about this in her blog, and points to programs, like Circle Urban Ministries, working to combat the reasons kids make choices that lead them to gangs and violence. Use the Interactive Map of the Tutor/Mentor Program locator and do your own analysis of the availability of volunteer based tutoring and/or mentoring programs in high poverty neighborhoods. Without more donations from more people in the private sector, there won't be more programs. They may even be less programs. Pick a program and become their financial partner. With President and Mrs. Obama providing personal support United We Serve, volunteering is likely to increase in the US. Since this is the time of each year when most volunteer-based tutor/mentor programs around the country are beginning to launch their Back-to-School Volunteer Recruitment campaigns, this is a key time for the Tutor/Mentor Connection and Cabrini Connections. However, it's a challenging time, too. Because while the President is providing public support to encourage people to volunteer, his stimulus packages have done little to provide the dollars for programs like Cabrini Connections to retain the key staff who manage the involvement of volunteers. He's done little to encourage foundations or individual donors to reach deeper to provide the dollars required for volunteer programs to operate. That's ok. Anyone can share this message and provide that encouragement. I think that's what President Obama hopes will happen. Many people will say "If it is to be, it is up to me." I looked up a study on volunteerism, titled Volunteer Management Practices and Retention of Volunteers, which you can find on the Urban Institute web site. One point highlighted was "No matter how well intentioned volunteers are, unless there is an infrastructure in place to support and direct their efforts, they will remain ineffective at best or, worse, become disenchanted and withdraw, potentially damaging recipients of services in the process." This article has good information for organizations who involved volunteers in their activities, as well as for business leaders who want to encourage employee involvement. If we want more kids to connect with tutors/mentors at the start of this school year, and still be connected next spring, donors need to find ways to reach out and touch tutor/mentor programs with some meaningful contributions. 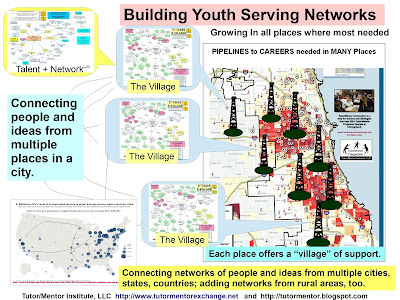 If you browse the links to Chicago area youth organizations on the Tutor/Mentor Connection web site, you'll find many that would use your contributions effectively. You can also use the interactive Chicago Tutor/Mentor Program Locator, to zoom into a Google map to search for tutor/mentor programs near where you live, or work, or along the route you travel as you come and go to work. Mr. President, please encourage people to volunteer dollars to places where other people volunteer time and talent. It will make the volunteer involvement much more effective and a much greater benefit to the people being served. I received a press release this week announcing that "The NFL Players Association (NFLPA), which represents every NFL player, is teaming up with the Corporation for National and Community Service, to encourage Americans to answer the President and First Lady’s call to service and make a difference in their communities." The partnership will include television public service announcements emphasizing the NFLPA’s support of the President's community service initiative. The PSA features more than 30 players from around the National Football League such as Drew Brees (New Orleans) and Brian Dawkins (Denver). United We Serve is starting with an initial 81 day burst of service, culminating in a day of service and remembrance on September 11, but it will grow into a sustained, collaborative and focused effort to promote service as a way of life for all Americans. This initiative, which aims to both expand the impact of existing organizations by steering new volunteers their way, and encourage new volunteers to develop their own "do-it-yourself" projects, focuses on five key areas: education, health, energy and the environment, community renewal, and safety and security. I encourage you to read El Da'Sheon Nix's blog. He uses sports analogies to make his point about how we need more than tutor/mentor volunteers to put a great team of the field. We need tech support, evaluation support, money and fund raising support, and so do all of the other tutor/mentor programs operating in Chicago. We've had several pro athletes visit Cabrini Connections this past year, and they offer great examples and pass on inspiring words of support. However, up till now few have reached out to donors, or into their own pockets, to provide the money that puts a tutor/mentor team on the field. Maybe the President's partnership will change this. Maybe the NFL will point to United We Serve, or the Tutor/Mentor Program Locator, in September when they are encouraging people to provide donations to workplace fund raising campaigns organized by the United Way. There are a lot of non profits who are not United Way members. If NFL commercials encourage funding of tutor/mentor programs, and if companies open their campaigns to "donor choice", then many people who want to help kids might write in a tutor/mentor program for their donation. That way the team going on the field, the volunteers that we're mobilizing, will be more likely to be supported by good equipment, good training, good coaching, and a good game plan. That's the way to build winners. I encourage you to visit the Royal Order blog to see the latest thinking as this team works to create a new interface between the world and the information on the T/MC web site. Does the graphic you're looking at give you more reasons to dig into the web site than what you see here? In the July, 21, 2009 Chicago SunTimes Mary Mitchell's column was about the Austin community's number 1 ranking for weapons violations in the past 90 days. Her plea is for tougher gun laws so more young offenders will know they will go to prison, and think twice about carrying a gun. She ends by saying "We need to do more to stop these offenders". Let's look at the rest of this story and expand what "we could do" to reduce the reasons kids are dropping out of school and choosing to become part of gangs and a culture of violence. Let's look at the maps to understand this problem better. This map shows the location of the Austin community on the far West side. To the West of Austin is the affluent Oak Park community. The Eisenhower Expressway passes through the South part of Austin, bringing commuters from the far west suburbs through the neighborhood and into the Loop every day. The color coding shows the level of poverty in the area. Using the Interactive Asset Maps on the Chicago Tutor/Mentor Program Locator I created this map, to show some of the banks, insurance companies, and pharmacies in the area. This map shows that there are very few major banks or insurance companies in Austin, or in the West side communities to the East, yet there are many surrounding this island of poverty. 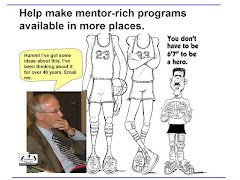 At this time the Tutor/Mentor Connection is limited in how many different business groups it can show on the Program Locator, because we've run out of money for continued development. 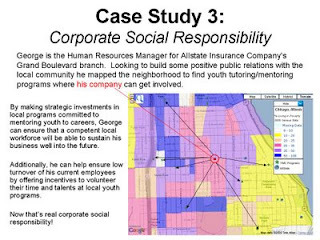 However, just with what we show let's imagine the leaders of each company shown on the map had read the Role of Leaders essay and had a team of employee volunteers looking for ways to help more tutor/mentor programs grow in the Austin area. Such teams could be located in the Loop, or in the far West Suburbs. If they focused on the transit routes bringing people through the poverty areas on the West side, they could begin to encourage people to think of ways they could support the existing programs they pass, with workplace fund raising, individual donations, corporate contributions, and with volunteer services. Using corporate communications companies can reach their employees and customers more frequently with reasons to volunteer, and links to the Program Locator, so people can choose where to volunteer. The result would be a growing number of people becoming personally involved in the issues Mary Mitchell is writing about, leading to more potential changes in public policy in the future. Let's look at one more map. This one shows faith groups of most major denominations which are located in this region. Where there are few businesses investing in Austin, religion seems to be a booming business. One of the main challenges of operating a tutor/mentor program is the cost of space, and finding locations close enough for kids to walk to, and safe enough for volunteers from beyond the neighborhood to be comfortable stopping after work for a couple of hours a week to be a tutor/mentor. We also put hospitals and colleges on this map because we believe that mentoring should be part of a public health strategy, led by hospitals and universities. Read more here and here. If the business teams, and teams from faith groups were to combing their planning, there could be many ways that faith groups in Oak Park and the West Suburbs, and in other parts of the Chicago region, could be partnering with faith groups in Austin to launch and sustain new tutor/mentor programs for kids in this area. If they adopt this strategy as the goal of each program, and the reason for business investment, the long-term benefit to kids in Austin, and throughout the Chicago region will be much greater than just getting new gun laws passed. The story our maps tell can change from year to year, only if people in the media, politics, religion and business begin to think strategically, and collectively, about ways to connect people who don't live in poverty with people who do. Tutor/Mentor programs, and the involvement of business volunteers in planning strategies like I've described, can lead to much broader involvement of more people in these issues. This can lead to better understanding, greater commitment to long-term solutions, and ultimately fewer kids choosing negative lifestyles. You can create your own map analysis, and jpg images,using the interactive program locator, that you can put into your own blog. 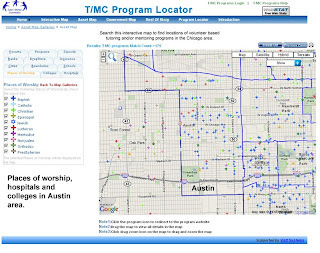 Here's a blog article Nicole White of the T/MC wrote to show ways to use the Program Locator. Read this article from the Black Data Processors Association Foundation. While corporate giving may be flat, or down, there are still lots of people bringing home large paychecks and bonuses. How do we motivate them to step up to fill this donor void? Mike Trakan, who creates the maps that the Tutor/Mentor Connection uses to draw volunteers and donors to tutor/mentor programs in different areas, was interviewed on Outside the Loop Radio, Fridays at 6p on WLUW 88.7-FM Chicago. You can hear the interview at this link. We held our annual golf benefit yesterday, and despite the economy, we had 97 golfers and more than 120 for the dinner. Included were some of our current students, and Tangela Smith Marlow, who graduated in 1997. Also in attendance was Chris Dowdle, who was Tangela's mentor for many years. My role in the golf benefit, which started in 1995, is to be the organizer and administrator. I like golf, but don't play any more because of health issues. The main one being, I can't see where the ball goes once I hit it (if I hit it)! So I go around the course on a cart and visit with golfers, and make sure our volunteers are having a good time, then I set up the silent auction and the dinner. Yesterday was different because I started to get severe chills about 4pm and by 6pm I could not hold a glass of water because my hand was shaking so much. Since we had so many leaders at the event, I decided to go home. Of course, no one would let me drive by myself, so Tangela and her friend offered to drive me home. I really appreciated that because it turns out I had a fever of 103. 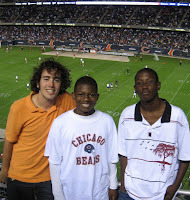 However, more than that, for 3 or more years while Tangi was in high school, and living on the West side of Chicago, I drover her and her siblings home after tutoring every week. Thus, I took care of her when she was young, and she took care of me now that she is an adult. This is what Cabrini Connections is all about. It's an anchor in the lives of kids and volunteers. If donors will provide the money to keep us in operation, we can continue to be a connection point for youth and volunteers from past years, and for youth and volunteers going through the program now. 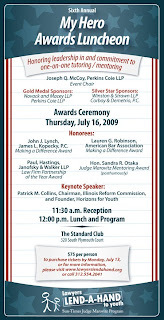 On Thursday, July 16, lawyers and judges in Chicago will gather to celebrate the work they have done in the past year to support at-risk youth, through volunteer-based tutoring and/or mentoring programs operating in different parts of the Chicago region. This event is part of an on-going strategy of the SunTimes Marovitz Lawyers Lend-a-Hand to Youth Program, which is raising money and recruiting volunteers to support the operations of volunteer-based tutoring/mentoring programs in the Chicago region. The Tutor/Mentor Connection and Cabrini Connections are beneficiaries of the grant making and leadership of the Lend A Hand Program. We're pleased to have been one of the catalysts for the growth of this effort, since we first connected in 1994. As you look at what the Lend A Hand is doing, we hope leaders in other industries, professions, faith groups and civic groups will review this strategy map animation, and see how they can form similar groups in their own industries. Leadership from many industries will result in volunteers and donors from many different sectors becoming part of Cabrini Connections and other tutor/mentor programs in the region, filling more of our operating budgets with dollars from many sources, and filling our tutor/mentor programs with volunteers who can mentor many different types of jobs and career opportunities. You can launch such a strategy, just by writing blog articles, or posting links in company or church newsletters in August, encouraging your members to visit T/MC web sites and learn about the different programs operating in Chicago, and ways to use time, talent and dollars to help each grow to be the best in the country. If you'd like our help, or can offer your support to the Tutor/Mentor Connection, just call 312-492-9614. Can this gap be closed with just focusing on "great teaching". Read this article and follow the links to the Catalyst Chicago seminars held in November and December 2008 and January 2009. Listen to the presentation by Dr. Michael Woolley , assistant professor, School of Social Service Administration, University of Chicago, which shows how youth in highly segregated neighborhoods with poorly performing schools seem to perform better when there are extra adults in their lives as mentors, tutors, friends, coaches, etc. 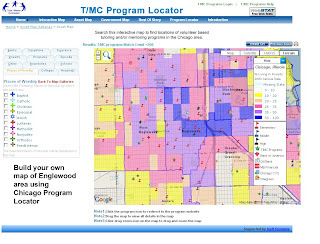 Then use the Asset Maps in the T/MC Program Locator to see how business, faith groups and others can mobilize volunteers and donors to help make tutor/mentor programs available in high poverty neighborhoods, so more kids have these resources as school starts in September 2009. 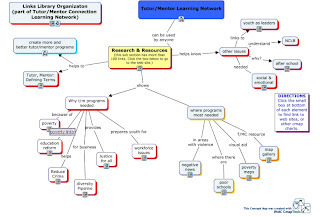 I posted a note on July 13, 2009, showing how our NU PIP fellow Chris Warren has created a concept map to point to the different articles he has written about Cabrini Connections and the Tutor/Mentor Connection in the past year. The concept map I'm showing here shows a section of the T/MC links library, where you can find articles about poverty, education, mentoring, and other related issues. Our goal is that groups form at colleges, faith groups, senior citizen homes, businesses, etc. who read these articles and discuss them, the same way people read scripture and discuss it. You can find the actual map here. When you click on any of the links, you go to the section of the Tutor/Mentor Connection library with links to web sites that provide that information. As more learning circles form, and begin to use this information, we'll begin to see more consistent and strategic actions helping kids in poverty stay safe in non-school hours, expand their networks of adult support, and move through school and toward jobs and careers. This survey highlights just how tough times really are, and the severity with which the economic crisis is affecting nonprofits. Cabrini Connections, Tutor/Mentor Connection is one of those non profits trying to find the dollars to maintain services. Our blogs and outreach are aimed at finding new donors who already want to help us, but just don't know we exist. I just wrote an article about 10 things you can do using social media. I hope this article convinces more of our volunteers and leaders to adopt some of these practices. This post is a collaboration between Max Gladwell and Mashable’s Summer of Social Good charitable fundraiser. It offers great advise that volunteers,leaders and youth in tutor/mentor programs might apply to help sustain great programs in more places. Cabrini Connections Golf Benefit, this Thursday. Can you help? We're hosting our annual golf benefit at Highland Park Country Club this week. We've about 80 players registered to golf and 100 people for the dinner and silent auction. All money raised helps pay for the work of Cabrini Connections and the Tutor/Mentor Connection. If you think this is important, I encourage you to help us with a donation, or come to the dinner and bid for items in the Silent Auction. Follow up to Englewood Story - What programs are in the area? Nicole White from the Tutor/Mentor Connection wrote an article on her blog, following up on the one I wrote on Sunday about how violence affects kids in inner city neighborhoods. She provides an introduction to the different organizations in the Englewood area which are listed on the Program Locator database. If you drive through this neighborhood as you come and go to work, why not contact one or more of these groups and ask how you can help them. Chris Warren, our 2008-09 NU Public Interest Fellow, starts his blog post saying "this is my 145th post". I'm written quite a few more than that in the past few years. While I have tags on the side of my blog, I often wonder how useful these are in helping others learn from what I've written, not just today, but over the past few years. Chris has found a way to map the articles on his blog, using a concept map, similar to how we map the strategy the Tutor/Mentor Connection. Take a look. If you book mark this you can follow Chris's suggestion, and learn from his year of experience, rather than starting from scratch. Looking for ways to give time and talent? If you visit this link to learn about Mozilla Service Week, you'll see a story about how Tim Hogan and members of his web development company are helping the Tutor/Mentor Connection update their web site. They are using their blog to draw attention to their work, and to recruit other volunteers. If other companies would do this they would be helping us mobilize more of the resources we need to help kids at Cabrini Connections and similar programs. Tim first became a volunteer with the Cabrini Connections program a few years ago. Recently he contacted me and said he had "more time to get involved". If you read the stories on his blog you'll see how his team is doing some serious work to help our non profit improve its efforts. This is what we talk about when we say "business involvement". 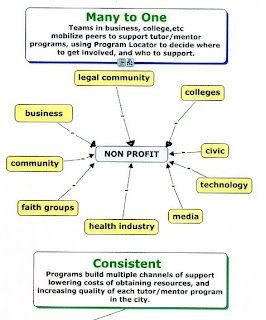 There are many ways the for profit sector can help non profits be more effective. However, it's not from random acts of kindness, but from thoughtful, deliberate actions, that we improve, and they gain more benefit from their involvement. I've a link to the Smart Communities blog on my links section because they frequently write articles related to schools, poverty and social engagement. This article is an example, and points to the Tutor/Mentor Connection as a resource. Message to Graduates - "living in relative poverty and loving my work"
"for the time being, living in relative poverty and loving my work is far preferable to any number of potentially more financially lucrative alternatives." My daughter graduated from Maine South High School in June 2009 and the two students who gave keynote addresses both talked about living a life of service rather than pursuing financial reward. I hope that they will find this article written by Chris Warren, who has just completed his one year fellowship with Cabrini Connections, Tutor/Mentor Connection. Chris will spend his next year in a Guatemalan non-profit school, as a volunteer. "now more than ever, we need to bring more leaders and other motivated folks into the fold to advocate for our youth, our programs and our future. Personally, I'm becoming more and more convinced that I am and will continue to be one of these people." I hope you'll bookmark Chris Warren's blog and find time to read some of the articles he has written in the past year. These provide a different perspective on tutoring and mentoring, and the Tutor/Mentor Connection, than what I write. Hopefully, the understanding you build by reading what Chris and others write leads you and others to make the same commitment Chris has made. 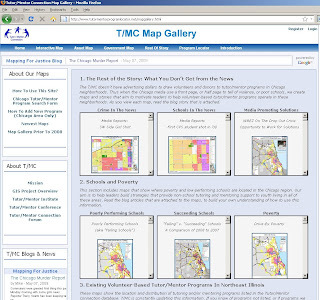 This is the home page of the new map gallery, created by Mike Trakan of the Tutor/Mentor Connection, to make the maps we have created available to users all over the Chicago region. Read Mike's description of the map gallery. Money raised at the annual Cabrini Connections Golf Benefit helps to pay Mike and keep this resource available to Chicago. Can you help? I've started a group on our Ning site, where volunteers can share ideas with myself and each other about ways they can help build a larger network of donor and volunteer support for Cabrini Connections, the Tutor/Mentor Connection and all other volunteer-based tutor/mentor programs in Chicago. The graphic on this page illustrates my goal. If we believe that volunteer based tutor/mentor programs are a value, then anyone can spend time each day reaching out to people they know to encourage financial support for any of the tutor/mentor programs listed in the Chicago Programs Links library or our Program Locator database. If you'd like to help, and can share your ideas, or want to ask questions, then I encourage you to join the Ning Group and help us give support to any one who wants to take on this volunteer role. 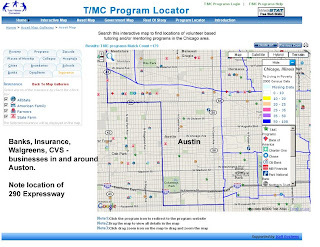 This is one of three Case Studies that Chris Warren, of the Tutor/Mentor Connection, posted on his blog to illustrate uses of the Tutor/Mentor Program Locator. Chris will be ending his one-year fellowship with Cabrini Connections, Tutor/Mentor Connection, in the coming week. The articles he has written over the past year will remain as curriculum that we hope others will use to understand the ways they can apply the Tutor/Mentor Connection concepts in their own business, university and community engagement strategy. If our founders took this perspective, would we be celebrating our freedom tomorrow? In the past week I've posted information about a report from the Civic Committee of the Commercial Club of Chicago, and a rebuttal from the Editorial Board of the Chicago SunTimes. I reviewed the Civic Committee report last night. In the concluding remarks the business committee report says "We cannot change the fact that some CPS students start school at a disadvantage. But we can change the fact that Chicago's schools do too little to overcome that disadvantage." If a business leader went to his boss and said, "we can't expand our market share because a competitor is doing something better than we are" that boss would soon find a new leader to find a way to compete more effectively. If the founders of this country had said "we can't challenge the rule of King George", where would be we today? The business community is right. "Chicago should offer school families more and better choices." This includes more and better non-school learning opportunities in the neighborhoods, and more vocational learning and mentoring in the workplaces. Not just more charter schools. The SunTimes is also right, "we need to think outside of the box". We need to make the learning, mentoring and achievement of all kids a responsibility of the business community, the faith community, and people who live in the suburbs surrounding Chicago who draw wealth from the city, and who have their own growing pockets of poverty and poorly performing schools. Until our business and community leaders realize that they must do more to influence what happens in the non - school hours to prepare kids for school, and for work, we'll not only fail to make much of an impact on how well teachers are able to teach, but we'll also continue to loose competitive advantage with countries over seas who are doing a better job preparing kids for 21st century careers. SunTimes: "Charters not only way to fix Chicago schools"
The editorial in the July 2, 2009 Chicago SunTimes rebuts a study released by the Civic Committee of the Commercial Club of Chicago as an "over simplistic analysis of test data, assembled largely6 to bash traditional public schools and promote the business group's preferred solution of Charter schools." The editorial concludes "There are lots of ways to improve failing schools. Charters are one way, but so is investing in traditional schools." We invite the media, and the business community, to take this advise and look beyond the traditional school "box" as a distribution point where learning reaches kids, and think of non-school locations where kids might connect with business volunteers, technology and arts, in a variety of mentoring and tutoring programs funded by the private sector, faith groups, and others interested in helping all kids come to school better prepared to learn. There are numerous articles on this site and on the Tutor/Mentor Connection and Tutor/Mentor Institute web site that provide ideas that business people might use. Thus, our reason for encouraging companies to recruit employees to become volunteers is that as they build bonds with kids these volunteers will begin to learn first hand what the challenges are that inner city kids and schools face, and some will begin to build a personal commitment to want to do more, because the kids now become "their own" kids. If companies encourage this involvement, in programs throughout Chicago, and in other cities, they can also host communities of practice, where volunteers who tutor, mentor, serve on boards, provide technology support, and make donations, can talk to each other, share ideas, and begin to innovate new solutions that don't focus just on investing in "smaller class size, better teachers, financial incentives for teachers and a longer school year". The longer working people stay connected to inner city kids, the more likely they will begin to innovate new ways to build learning aspirations and use business resources to help kids prepare for 21st century careers, regardless of what the traditional school establishment does to support this. President Obama's Barbershop premieres their touring art exhibition, which focuses on the art & nature of barbering from 1927 to present. 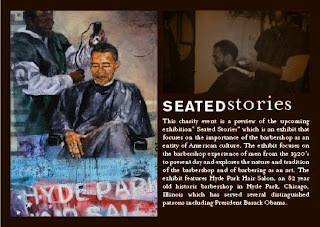 President Barack Obama's Barbershop will host a charity event introducing their touring art exhibition titled Seated Stories which focuses on the art and nature of barbering from 1927 to present. CHA Mixed Income Buildings - Is it working? Are you living in one of these mixed income buildings? Is it working? What's your story? This is important to us at Cabrini Connections because much of the Cabrini-Green area where we draw kids from has been converted into mixed income buildings. Some of our kids live in these new units, and some still live in the Row Houses. We only have 65-75 teens in the program each year, and some live in neighborhoods beyond Cabrini Green as a result of moving from the area, or as a result of parents making a strong case for us to accept their kids. However, it's getting more and more difficult to attract funding because many donors think that tutor/mentor programs are no longer needed for the Cabrini Green area, due to the massive growth of mixed income, and upper income buildings in the area. However, I'd like people living in these mixed income areas to think in a different way. If you read the Tribune article there is quite a bit of strife between the two income groups living together in these buildings. What if this causes more people to not want to purchase units. What will that do to property values? Wouldn't it make sense to invest in programs that create some interaction and bonding between the youth and adults of the two economic brackets. That's what programs like Cabrini Connections do. They connect people who would not normally be interacting with each other. Building managers don't have expertise in organizing these programs. We do. Wouldn't it make sense to invest in these types of programs, as an investment in your property values? Think of it. If you paid $400,000 for a unit and the property value declines 20% because people don't want to buy, that's a $80,000 loss. Doesn't it make sense to donate a couple thousand dollars a year to a tutor/mentor program with the goal that you make mixed income housing work, so your property values go up? What if you're not in the Cabrini Green area. What if you want to start a program like Cabrini Connections? Where do you find the ideas for building such a program, or people to mentor you and your leaders to help a new program grow from being a start-up, to being good, then being great? That's what the Tutor/Mentor Connection offers. 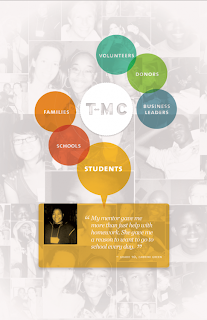 When you invest in Cabrini Connections, you're also investing in the T/MC. You're supporting our efforts to create a library of information that can help people in neighborhoods throughout the Chicago region, and in other cities, build programs that connect people from mixed income brackets, and different social and age brackets. You're investing in the diversity of the city. What if the economy caused us to cease operations? Who would provide the services we provide?